We often feel a need for a security app. Sometimes we need a security app to protect our Android smartphone from different types of trojans, keylogger malware, or worms. Or sometimes we just need an app to lock some android apps or find if someone else was trying to unlock your device or not. Just in case if you too have this question that says “what is the best security app for android?” then we are here to help you out. We have handpicked some of the best security apps for android smartphone and created a list of Best Security Apps for Android 2018. 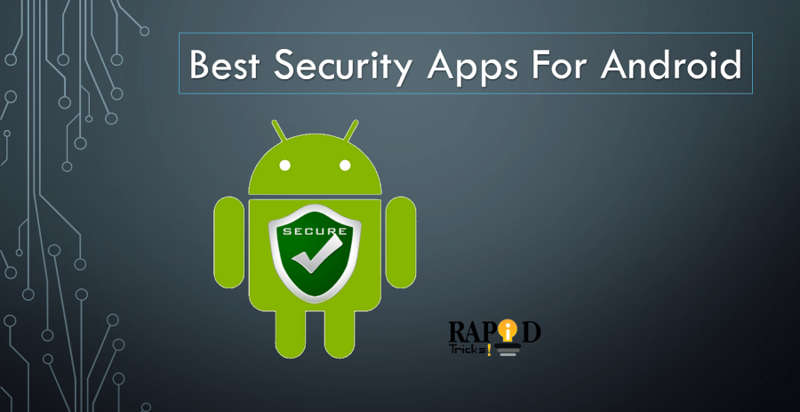 Below I have listed the best and highly rated Android security apps on google play. I have handpicked these apps for you to help you make your Android phone more secure. You can install any of the given apps on your Android smartphone and protect your smartphone and tablet from malwares and unauthorised use. So let’s start the list of best security Apps for Android of 2018. At first, we have the Avast Mobile Security application. This android app works as an antivirus application as well as offers quite a lot of other features, which you may feel a need of. Talking about the features of the Avast mobile security, with the help of the app you will be able to protect your devices from different types of viruses and malware. In addition, you can use the app to block a phone number, add unlock to access feature to your smartphone apps. You will also get features like junk cleaner, web shield, power save, wifi scanner and speed test. Also if you are a rooted user then you will get firewall feature as well. You can download the app for free from the Google Play store so do not forget to have a look at this one. Find My Device is a tiny app from the search engine giant Google which helps you to find your lost Smartphone, Smartwatch or laptop. Just in case if you ever lost your Smartphone, Smartwatch or laptop you will be able to locate the app. Also, you will be able to erase data. You can also play a sound on your smart device so you can track the device down easily. However, if your smartphone’s GPS is turned off then you will not able to track. CM Locker is the best security app for android when it comes to securing android apps. It helps you to protect your apps from third-party access. However, you will not be getting any features along with the application. By using the app you will be able to add a pattern lock or pin lock or fingerprint lock on apps like Facebook, Whatsapp. Also if anybody on behalf of you tries to enter the wrong pattern or pin the app click a selfie of the user. This way you will be able to know who was trying to unlock your device. Also, the app is completely free to download and use. So make sure you are checking it out. If your smartphone has some sensitive media. Or files and SMS that you want to protect then met with the Vault Hide. Vault Hide is the best security app for android smartphone that one can download. It helps you to hide images, videos, SMS. It also offers app lock and cloud backup. It also comes with a private browser that protects your internet browsing history and bookmarks. Talking about the cloud feature, well with this feature you will be able to transfer your data from an old smartphone to a new one. So do not forget to check this app out. Up next we have the LastPass Password Manager which is also the best security app for android tablet and smartphones. With the help of the application, you will be able to store your passwords. All you have to do is create an account and you are all set to use the application. The app will autofill your passwords and emails as well as personal information. You can also save secure information like credit card details and so many other features. The application is free to use however some features come with a subscription. So it is advisable to try out the application by yourself. At the next, we have another best security app for android mobile. The Security Master application not just offers antivirus solution for your smartphone but it also comes with VPN. With the help of the VPN, you will be able to country blocked web contents and so on. Apart from these two features, it comes with junk cleaner, CPU cooler, battery saver, phone boost and so many other features. It also offers app lock so you can secure your android application. So do not forget to try this app out as well. At the end, we have another best security app for android phone which is the Jio Security. The app comes with so many awesome features including, Antivirus solution. App advisor, find my phone, anti-theft and so on. It also offers web protection, which helps you to remain safe while surfing the internet. The application looks for the malicious code of the websites that you visit and notifies you about it. With the help of the anti-theft feature you will be able to remotely lock your device, and as a result, the theft will not be able to access to your device without entering a passcode. Also, the good thing is that all these features are available for free. So make sure you are checking out the app on Google Play store. So that was all for the Best Security Apps for Android 2018. We hope that you are going to try each and every app listed above individually and figuring out the best application for yourself. Also, you can read the user reviews before downloading an app. Anyway if you have any questions then feel free to comment down.